Dr Matt Miller and Roslyn School pupils watch as Nadia Mokai-Sharp negotiates the timing gates to measure her motor coordination and reaction speed. 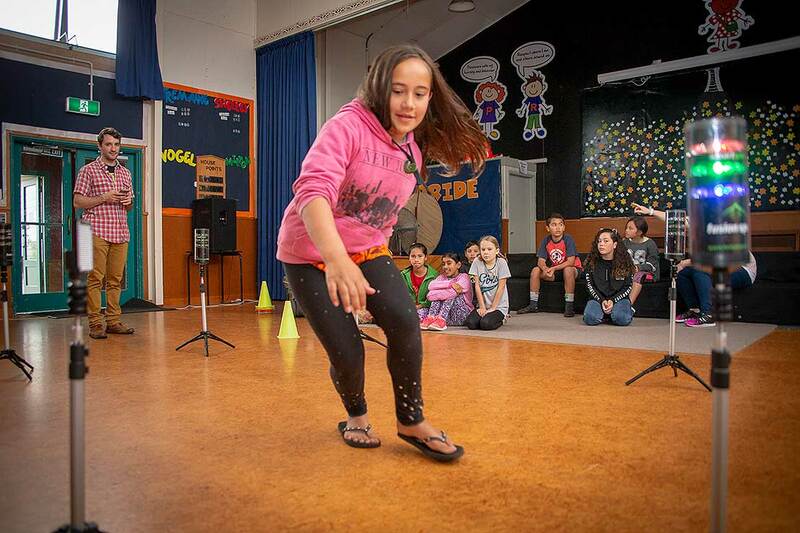 Children at Palmerston North’s Roslyn School got to experience Massey University’s mobile exercise lab – The Human Engine Room – on Monday, as part of an initiative to help improve the way science is taught. Dr Toby Mündel from the School of Sport, Exercise and Nutrition ran the workshop, with lecturer Dr Matt Miller and laboratory manager Adam Miller, as part of being a host for the Royal Society Te Apārangi’s Science Teaching Leadership Programme (STLP). The team was working with teachers and STLP participants Karen McLeod from Roslyn School and Brenda Stephenson from Russell Street School. The group took around 90 students through three activity stations, each lasting fifteen minutes. 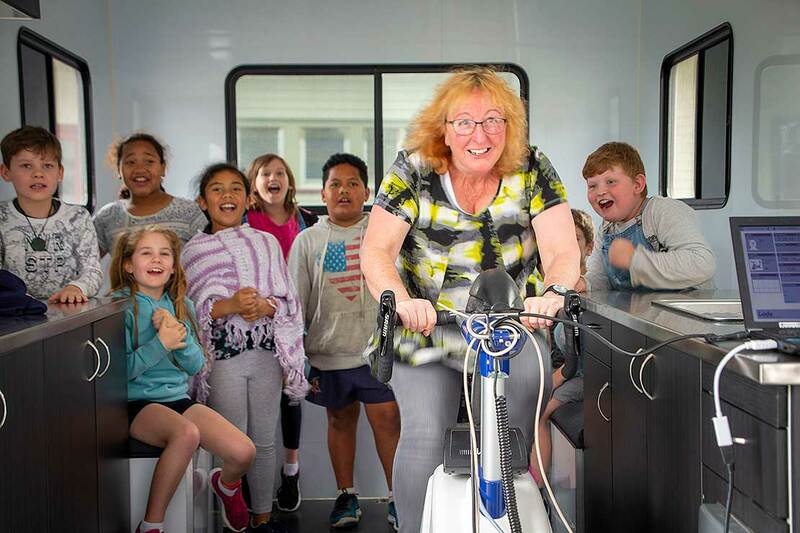 Pupils cheer on teacher Karen McLeod during a cycle test inside the mobile lab. “Hosting teachers through the STLP allows us to re-connect with the community and interact with young learners that we wouldn’t normally get an opportunity to work with. It also allows us to build and maintain these relationships with the schools to create a ‘knowledge network’ within Palmerston North,” Dr Mündel says. The programme provides opportunities for primary and secondary school science departments – and their nominated teachers – to enhance the teaching of science within school communities. Teachers spend six months working with academics to improve science leadership within their schools, to enable better science learning experiences for the children. 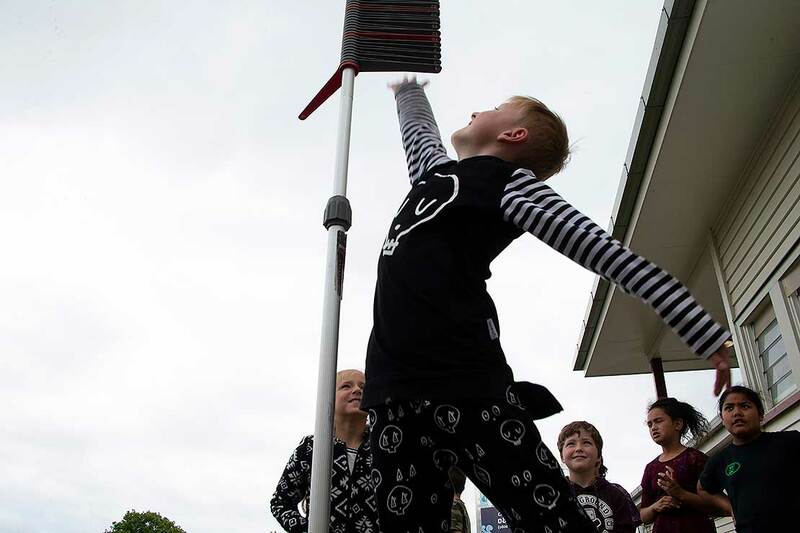 Through workshops and online discussions, the teachers expand their understanding of the Nature of Science strand in the New Zealand Curriculum. Through a master’s level programme aimed at educational leadership, teachers explore their leadership capacity by focusing on their personal growth and development. They then move on to phase two, which takes 12-18 months, where they are back at school. The teachers and their schools work together to improve science teaching and student learning. Vinnie Allen uses the jump stick to measure his vertical power. Mrs Stephenson is looking forward to taking what she has learned at Massey back to her students at Russell Street School. "Being hosted at Massey University has really given me an appreciation for science research. During my placement, I have made many connections with a variety of departments. When I return to Russell Street School next year, I hope to build on these connections."